Do you really need to redesign your website? It’s certainly tempting, especially when you’re encountering problems with your current site. However, redesigning your website could cost you thousands or, if you’re doing it yourself, months and months of work. There are times when a redesign is essential. But other times, you may just need to tweak and test your website to solve the problem. In this episode, we look when is the right time to redesign and when tweaking and testing might just do the trick. 1.05 – Redesign vs Website tweaks – why are we talking about this? 3.52 – When should a company redesign their website? 4.15 – You can’t polish a turd! 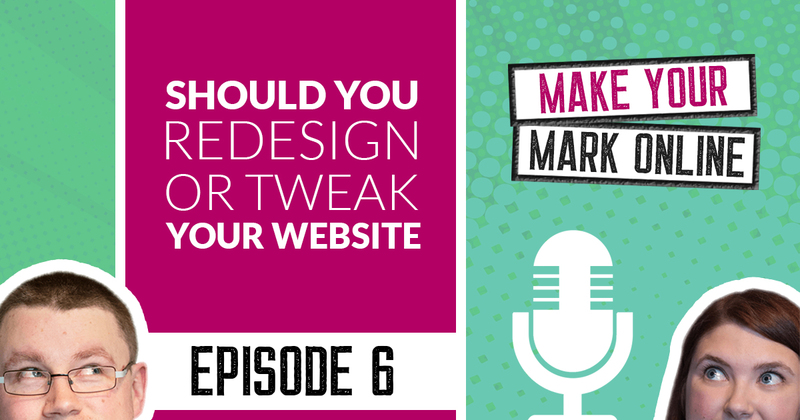 09.58 – When should you just tweak your website? 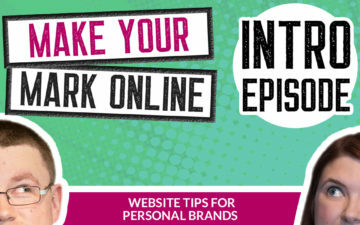 Speaker 1: Welcome to the Make Your Mark Online podcast where we help personal brands build and grow a successful business website. 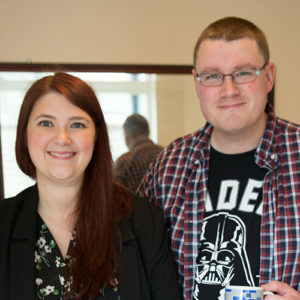 Please welcome your hosts, husband and wife team, Martin and Lyndsay. Martin: Welcome to episode six of the Make Your Mark Online podcast. 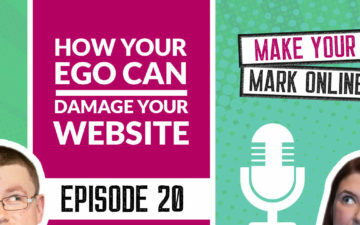 In today’s episode, we’re going to be talking about … It’s about whether or not you should redesign your website or whether or not you should tweak a few things on your website. So it’s a really interesting discussion actually and we’re looking forward to this because it is a question that pops up quite a lot. Now, before we get into the show. Just wanted to remind you that we have just launched our wait list for the Make Your Mark Online membership, so we’re really excited. We’re going to be taking all of the knowledge and experience that we have and actually packaging it up in a membership community. So feel free to go to jammydigital.com/wait and add your name to the list and we will let you know as soon as it’s ready. So let’s get into the show. Okay. So Lyndsay, redesign versus website tweak. Why are we talking about this? Why is it so important that we cover this in an episode? Lyndsay: Well, I mean we say redesign versus website tweak, but the majority of people when they encounter problems with their website, whatever those problems might be, automatically go to redesign as the only option available to them. I think it’s because … It’s quite an attractive solution isn’t it? You know it’s going to make some sort of impact and it’s quite an attractive project to take on. Yes, it becomes very appealing, a redesign, but sometimes it’s not the best option for you. Sometimes, it can just act as a distraction in your business. A redesign could cost you thousands of pounds with an agency or a freelancer. It could cost you 6 or 12 months or as we’ve experienced some of our clients, even 18 months of their own time. It’s a big project to take on and it can often, as I’ve said, act as a distraction from your business. Martin: Yeah. We’ve seen that for ourselves. It’s funny though. Because we know from experience that your website never stops. It’s never finished, so you’re always going to be making tweaks anyway I suppose. So what we’re really talking about here is actually having the decision to make, whether or not you actually move forward with a full redesign or whether or not you focus entirely on tweaks, but you can’t just kind of half arse it in way. We’re talking about making a decisive step in your business, aren’t we? Lyndsay: I think what it is about is identifying the issues that you’re having with your website. That is the step that most people miss. So they don’t know what’s going wrong with their website. They might not be sure or they might not have thought about it. All they think is, “I need to redesign it and that will fix all my problems.” You need to take stock really of what the actually problems with your website are and identify those issues because you may find even if you redesign the website, you’ve still got those problems anyway. Lyndsay: So it’s a real difficult one. So that step needs to take place before you either decide to redesign or you need to decide to actually just make some tweaks to it and see, sort of test what works. Martin: Okay. And I suppose it doesn’t actually matter whether or not they are a small kind of one-man band or they’re a big kind of company. Lyndsay: No, not at all. It applies to anyone really who’s thinking, “Well, my website isn’t working. It needs to be better. What can I do?” Yeah, this applies to all people that are in that situation. Martin: Okay, okay. Fantastic. Okay. So let’s sort of throw a few examples out there. So when would a company need to redesign their website? So we’re talking about one versus the other. Let’s just say they’re at that fork in the road and they deciding, should we do one, should they do another. When should a company redesign their website? Lyndsay: Well, I think there’s some sort of clear indicators that you should redesign your website. One is if you absolutely hate it. Martin: That’s a clear sign. Lyndsay: It’s a good, good idea to redesign it. Martin: It makes you physically sick. Martin: Yeah. Just a blank canvas really. Lyndsay: Yeah. You need to look at it. You either need to go to an agency who will make it a lot better for you or a freelance web designer or you need to look at maybe doing it yourself with a much better looking template or something like that. But there are … Yeah. There are plenty of ways for you to make it better, but yeah, that is definitely one way I’d say. Martin: You can’t just tweak away ugly can you? Lyndsay: Yeah. If you’ve got a turd of a website, unfortunately, you can’t polish that. Martin: That’s what we should title this episode. Martin: “Polish a turd.” Okay, perfect. So yeah, that’s a clear sign. No argument there. What other reasons might there be for someone to feel the need to redesign the site rather than tweak. Lyndsay: Another one perhaps … Perhaps you’re even happy with the design, but … We have a lot of clients come to us that have designed the websites themselves. They’re okay with the design. It’s not the best but they’re okay with it, they can [inaudible 00:05:52] it, but the sort of technicalities behind the website just aren’t up to scratch. Martin: Yeah, We’ve seen this a lot. Lyndsay: Yeah. So the framework might be out-of-date. They might be using Flash. They might be using a website builder that just does not do what they need it to. They might be sort of taking … The website might be taking too long to load. They might be sort of fueled by about 100 plugins that all need updating and things like that. I think when you start to build a website yourself and you get bigger as a business, you start to keep adding things onto it. Adding and adding and adding. And trying to create these solutions to problems you’re having with your website by sort of having a plugin there or bringing something in there. And all of sudden, it becomes this giant monster of a website that takes so long to load because there’s just so many things happening and you need an expert to come in really and sort of build something bespoke, that really is tailored to your business and works technically as well. Martin: So even if you like your website, if it’s powered or it looks as though it’s been built on … It’s a house built on sand, then it’s time to sort of rethink it. Lyndsay: Absolutely, absolutely. And I think this is … Yeah. Like you said, it’s more of an issue with perhaps more established businesses that are sort of looking for more bespoke solutions. They’ve perhaps had a little bit more money to invest in those kind of solutions as well where technically, they need something really a bit more bespoke for them. For new business owners, this may not be as much of an issue because you’re starting out, your website should be quite light and it should be quite easy to use. You shouldn’t have too much powering it. But yeah, definitely for more established business owners that have sort of piled on over the years. These random things to sort of help their website function and yeah, it becomes a bit of a … Like we said, a bit of a monster. Martin: It’s a bit of a time bomb as well, ain’t it? Because at some point, something’s going to go wrong. Martin: Okay. So what other scenarios might there be if somebody does really need to redesign? Lyndsay: … features and functionality you might need. Martin: Might completely change altogether. Lyndsay: Exactly, exactly. So that’s another case where we would probably say a redesign is going to work for you. Definitely. Martin: Yeah, okay, okay. So three solid reasons there. So if our listeners actually can identify with any of those, then that’s a clear, clear indication that they should be looking at a redesign rather than just a tweak. Lyndsay: So yeah, definitely. I would say just some are probably ugly website, technical problems that you’re having with your website. Martin: Yeah. Site speed problems, all that kind of stuff. Lyndsay: Exactly. Exactly, yeah. And then if you’re completely sort of repositioning yourself as a business, yeah, those are the three where I’d say you probably do need to look at a redesign. Martin: Okay. So let’s flip it then. So what about if somebody is … They have a website and they’re not quite ready to redesign it or maybe they’re just not sure if they should. What scenarios might they be looking at? What kind of position would their business be at? Martin: Phone calls or email opt-ins. Martin: All that kind of stuff. Martin: Okay. That makes sense. I do feel as though part of the reason people jump on the redesign sort of bandwagon is because they’re not sure what they should tweak. Martin: So that’s part of the problem when we’re talking about website redesign versus tweak. It’s clear what a website redesign is, which is probably why a lot of people jump on that one. Martin: But what do we actually mean when we’re talking about tweaks? Have we got any sort of examples of things that we can make changes to our website that will actually improve someone’s website? Even if they’re considering a redesign in the future, maybe even three, four, five months, what can they do in the meantime now to tweak the website to see if that solves their problem? Lyndsay: Right. Well, I think certainly with traffic … So you’re not getting enough traffic and that’s one of the key problems that people have. Now, firstly, you need to identify that you’re not getting enough key traffic. The best way to look at that is to look at your sort of analytics and see sort of what’s happening there. Your Google analytics is the best place to look at that. Martin: Yeah. There might be technical issues that your tracking code might not be set up straight. Lyndsay: … where people’s Google Analytics tracking codes are improperly set up. Lyndsay: Yup. That’s a bit of a disaster. Lyndsay: Yeah. Look under the hood. Martin: … [body 00:13:04] really and have a look. Lyndsay: Yeah, definitely. So say you’ve identified, “Okay. I’m not getting enough traffic to this website.” Then, it may not be a website problem at all. It might be something to do with how you’re getting traffic to your website. So website design and website build as the famous phrase was, “Build it and they will come”, doesn’t actually work anymore. You can build the most beautiful, wonderful, technically advanced fantastic website in the world, but if you’re not getting people to it by using certain marketing strategies and methods, then it’s completely pointless. So you might need to look at things like content marketing, your social media marketing. You may need to look at doing on-site and off-site SEO and PR, and things like that to actually bring traffic to your website. Redesigning your website will not impact your traffic. It may do if you’ve built something on it, say [so your 00:14:02] crappy Flash website and it’s really not performing on search engines, it might increase the traffic, but you still need to put that effort in yourself and actually bring traffic to your website. Martin: It’s true and that’s not so much as a tweak as opposed to marketing. Martin: It’s true. Okay. So if it’s marketing, then we’re talking about actually going through and from a content marketing perspective, actually really going into depth about questions that people ask. It’s about providing epic content. It’s a case of do you really want to spend thousands on a new redesign and be in the same position in 6 months, 12 months time when all you really needed to do was spend a few months writing some epic content and you’ll get [inaudible 00:14:48] traffic to your website. Or tweaking the different SEO elements or the titles and things that we’ve covered in previous episodes. Martin: It is the … I kind of just want to slow things down a second because this is something that I really want our listeners to understand. When we have the opportunity to work with clients, whether that’s … Maybe they’ve got a website critique from us. Maybe they’re just asking us questions. Maybe we’re doing a full redesign. Under almost all circumstances, when people come to us and they say, “We’re not getting enough traffic. We want to throw thousands at it and we want to just optimize it and get loads of visitors to our website”, the number one biggest differentiator from a website that’s successful and a website that isn’t is not the little technical aspects. It’s content. Content marketing is so important. So many times people come to us and they’re like, “What colors should my buttons be?” And, “Should I have my image here or should I have my image here?” Or, “Should I have five stars here?” It’s about showing Google that your website is incredibly valuable. And the websites that have true success are the websites that understand that spending the time to write great content and provide awesome resources, that is what will reward you with traffic. Lyndsay: Yeah, definitely. I totally agree. I think before you get down to the real nitty-gritty of, “Should I make this button green or orange? What will work better for conversions?” And things that … Before we start to get in the nitty-gritty of that, you need to get the basics right. You need to think, “Okay. Well, I need to actually pull people in. I need to create a great content marketing strategy.” And we always … I always give a shout-out to this guy because he’s just amazing, but we absolutely live by Chris Marr’s rules. He runs Content Marketing Academy. We’ve seen a massive improvement in our business since we’ve started, since we’ve joined his membership and we started content marketing, haven’t we? Lyndsay: Yeah, definitely. Content marketing is very much a long-term strategy, isn’t it, Martin? Lyndsay: Although, we actually saw results after sort of three months really. So it’s a not a very, very long-term strategy but certainly over a period of 3 to 12 months, we’d recommend that you really sort of get into it. But are there any short term things that people can do to perhaps see why they’re not getting enough traffic or perhaps increase their traffic? Is there any way people can sort of quickly look at that or try and solve that problem? Martin: Yeah, of course. So there might actually be a technical issue. So yeah, if traffic is the problem and you’re not sure what to tweak, I would just make sure you’ve added your website to Google Webmaster Tools or Search Console as it is today. Actually check to make sure all your tracking is set up properly. There’s lots of reasons that you might not be feeling like your website’s working, even though you might be, you just haven’t got the tools and the data to prove that it is. So you want to make sure that all the technical stuff is there. Hire someone, maybe pay 50 to 100 pounds for somebody to take a deep dive into your website to just confirm that everything’s okay. So from a traffic point of view, obviously there’s the content marketing [everything 00:18:44], but you need to make sure the technicalities are in order as well. Lyndsay: Yeah, okay. Definitely. So there’s sort of one long-term strategy there and then a few sort of quick things for you sort of check. So another issue that people have with their website where we say, “Hang on a second. You might not need a redesign” is with website conversions. So say you’re happy with the design and the technicalities of your website. You’re happy with where you’re positioned in your business, nothing needs to change on that front. Say you’re getting plenty of traffic, however which way, through content marketing or SEO, but let’s say that traffic is not converting into leads and sales. This is not a particular point where you need to think about redesign. You may have to redesign in the future, but I wouldn’t do that yet without first doing a few things and changes to your website to see if that makes any difference. Because you may spend 5, 10, 15 grand on a new website and that may increase conversions, but you might have been able to achieve that anyway on your own website without doing it, without spending that money in the first place. Again, same if you’re spending your time doing it. Just focus on those little tweaks that you can make that perhaps could increase conversions and just test to see first if that works because that can obviously save you a lot of time and money. Martin: Yeah. So have we got any kind of quick ways that people can do that, go through the website? Maybe they do decide to redesign in the future, but at least they can do a few bits now. Lyndsay: Yeah, definitely. I think one of the main things that we see that really sort of helps conversions or helps people getting in touch with you is the big bold statement as we call it. We actually did a podcast episode about this on episode five of our podcast, so the previous one. If you want to go and listen to that where we teach you exactly how to write a big bold statement. Essentially, it’s the first sort of sentence, summary statement that people see when they land on your website. It should be on the homepage in the first third and it should really clearly state what it is you do and how it is you help, and so many businesses forget this completely. It’s just bonkers really because it’s such an easy way to sort of increase conversions. I think a good way of seeing whether this is a problem as well is to check your bounce rate on Google Analytics. Are people landing on your website and hitting that backspace button because they’re either confused or they’re just not in the right place? Martin: Not going to stick around on it. Lyndsay: Exactly. They’re not going to convert into sales and leads. So I think you need to look at your website and think, “Is it clear what I do?” So another thing people get very wrong on their website is signposting. Now, what we mean by that is we mean sort of clearly directing people where you want them to go on your website. If someone is confused about where they should go next, then that’s not going help in terms of conversions because you’re not going to get them to the page that they need to see. You’re not going to get them to the place where you can read more about the product or service that is for them. So signposting is a very easy way to actually increase conversions because you’re sort of directing your traffic where you need to go. Martin: Okay. So yeah, we’re talking about call to action, actually having buttons and direction, actually pointing people. Actually imagine that you are taking people into your restaurant and you’re sort of directing people, “Go this way. Go this way.” And actually organizing your website like a well-oiled machine, actually pointing them in the right direction so that they can self-serve. Actually, this is one of the biggest reasons why people don’t click through to other pages on your website, because you don’t make it obvious enough. It might be a really appealing offer. You could be giving away free money, but unless you actually make it obvious enough, then people aren’t actually going to go through to another page. That’s why we see nice big bold buttons next to the big bold statement sometimes. Think about what it is that you want your user to do. Lyndsay: Yeah. This is particularly important if you offer more than one service, which a lot of companies obviously do. If you offer sort of three, four, five different types of services aimed at different types of people, then you need to clearly signpost on your website where these people should go and make it very, very clear. It sounds obvious but it’s amazing how many people don’t do that. We are so involved in our businesses and our websites that we assume other people just kind of can grasp what we’re trying to tell them, but you need to really clearly direct people. Yeah. It’s just the same as sort of having a map really of your website. You need to make sure that it’s very, very clear. Martin: It’s all about user experience at the end of the day and if you don’t think about users first … This is why businesses where they just shout about themselves and, “We do this and we do this.” Sometimes, those websites don’t work very well. It’s because when you consider your users … And this is something you can do straight away to actually tweak your website and see if it improves it. Actually give yourself a call to action or a signpost to where you want them to go. On every available page on your website, actually direct people, where is the next logical step you want me to go. And if you can keep these people on our website for longer, then we build up more trust, build up more credibility. Maybe they’ll fill out a form on our website or give us a call. So that’s something you can definitely do straight away. Lyndsay: Yeah, absolutely, absolutely. And then there’s one … We’re talking very broad strokes here. Because we’re talking about conversions and this is probably something that we’re going to go into more depth later on in our podcast series. But yeah, these are more sort of quick things. And I think the final thing, this final sort of major thing is the copy on your website. Martin: Yeah. This is something you could definitely change straightaway. Lyndsay: Exactly. Yes, yeah. Now, it’s maybe the most fun thing to do depending if you like to write or not, but it is incredibly important for conversions. I’ve seen websites with very little copy and it looks like someone hasn’t taken the effort really to sort of write it. And some websites where there’s way too much copy and it’s all over the place. It’s not structured right. There aren’t any headings to tell you what the next paragraph is about. There’s so much that you can do with copy. 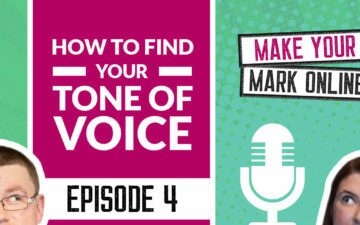 And we do actually have a podcast episode about sort of your tone of voice for personal brands that might help, but certainly you need to think about your copy and how you’re appealing to your target audience, how you’re speaking to them, making it focused on exactly the service and product that you’re selling. There’s so much that you can do with copy. You really need to take sort of some time to look at that because it could make a huge, huge difference to your website and could potentially save you cost or time in redesigning it. Martin: Okay, yeah. So we’ve got a few great tips there. We’ve got check your tech issues, just in case that’s what’s causing the problems. We’ve got the big bold statement that’s really important as well. These are things that you can tweak on your website now. Test, see if they’re working, change your copy around a little bit. Lyndsay: And then look at your signposting as well. Martin: Yeah, look at your signposting. So even if you do decide to redesign your website in three, four, five months, whenever, at least do these things first, work out if it makes any difference and if it doesn’t, then that might be a situation where you’ll actually say, “You know what? I’ve tried it. I’ve done some research. I’ve created a big bold statement. I’ve shared it in the Facebook group” with us and we’ve said it’s good. And you’ve done all those things but it’s still to quite working, then it might be time to look at a redesign. Martin: Cover yourselves first by making those quick [win 00:26:59] fixes. Lyndsay: Absolutely, yeah. I totally agree. I think … Hopefully, we haven’t put you off completely from redesigning because yeah, at some point, you may need to redesign your website. And we always recommend every sort of three or four years anyway to sort of have it refreshed, whether you do it yourself or you go to an agency or freelancer, but certainly it’s not the answer to all problems. Sometimes, the problems can still remain there if you do redesign and haven’t identified what the problems are with your website in the first place. Martin: That’s great, yeah. If you can just take one thing from this episode, it’s a redesign is not necessarily going to solve all your problems, so … Perfect. Great. Okay. So we hope you enjoyed this episode. If you’re not a part of our free Facebook group, and we spoke about it briefly in this episode, go to jammydigital.com/facebook and join the community. Introduce yourself, tell everybody who you are, what you do and throw your name in the hat for a free website critique. We’re still doing these at the minute. I’m not sure how long we’re going to be doing it for. If you throw your name in, we will add you to the list. It’s not a competition. We’ll just get through them as we get through them. Lyndsay: Yup, we will. We always make sure we do. Martin: Yeah. And we really love it. And don’t forget to add your name to the wait list if you are interested in improving your website. Everything we’ve just been talking about in this episode, we are going to go through in our new membership. Lyndsay: Absolutely, yeah. We’ll be talking, obviously, about SEO and conversions and sort of your brand and things like that. So yeah, certainly we’ll be covering that in the membership. Yeah, definitely. Martin: Plus, we’ll be helping you redesign it if you want to redesign it if that’s the outcome that you’ve got from this episode, so … Perfect. So we hope you found this episode useful and we’ll see you next time on the Make Your Mark Online podcast.